There's a scene in nhis 1987 film Intervista, where Federico Fellini is describing to a Japanese film crew a dream-sequence scene he is about to shoot. "I found myself in a dark place," says the renowned Italian director, "unsettling, but at the same time familiar, with never-ending walls." Perched on high, he watches as lights fire up across the landscape in front of him, wisps of dry ice and wind sound effects accompany an aerial view of ochre buildings and pine trees that spread out. "Is the territory below a prison, university campus or nuclear bunker?" asks Fellini, before answering his own question. "It's Cinecittà." Pronounced chee-nay chee-TAH, which translates as "cinema city", the subject of Fellini's film is a sprawling 40 hectare (99 acre), 22-studio complex, located 9km south-east of Rome. Since it opened in 1937, it has established itself as Europe's largest, most iconic film studio - a place that has inspired cinema legends, from the 1950s neo-realists to today's Hollywood greats, including Martin Scorsese and Woody Allen; and where over 3,000 films have been shot, 48 of which have won Oscars. This month, film fans are in for a rare treat. To mark the 74th anniversary, the studio is opening its doors to the public with a host of exhibitions and shows. Until 30 November, visitors on the Cinecittà Si Mostra tour can move amid epic sets and diva's wardrobes, and wander between 1930s pastel villas, cavernous soundstages and atmospheric sets - including a fibreglass Broadway and an Ancient Rome. People talk about the golden age of Italian cinema in the 1950s and 1960s, when films such as Fellini's La Dolce Vita won world acclaim, cementing Rome's status as a buzzing city full of beautiful people. The studio was at the centre of this movement, but it wasn't only Europe's finest directors and actors who flocked to the hallowed gates on Via Tuscolana. Cinecittà also attracted American film makers, which is why it became known as "Hollywood on the Tiber". Audrey Hepburn and Gregory Peck whizzed around the city in Roman Holiday (1953), hanging out with Sophia Loren and Errol Flynn. 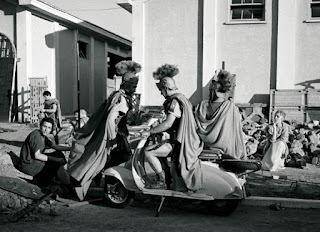 William Wyler shot MGM's Ben- Hur there in 1957, with a then record-breaking $7m budget: shooting Charlton Heston's Circus Maximus chariot race took over five weeks and involved 15,000 extras. Cleopatra (1963) was a money-haemorrhaging, 30-month saga (budgeted: $2m; actual: $44m) that spawned Richard Burton and Elizabeth Taylor's boozy love affair. It's all a far cry from the origins of the studio. In the 1930s, Italian futurist artists were embracing the new dynamic medium of cinema and then prime minister, Benito Mussolini, recognised it could be a powerful ideological weapon. So, in 1936, he decided to build a studio. The new Cinema City had everything for film making - theatre studios, technicians, artists, a cinematography school - and, headed up by politician Luigi Freddi, the complex began to churn out propaganda films at a rapid rate. This went on for several years until, in September 1943, as World War II approached its peak, the studio was closed after Allied bombing reduced it to near ruins. By then, some 300 Fascist films and historical dramas had been shot. But this wasn't the end - in fact, in many ways, it marked a new beginning for Cinecittà. In the aftermath of the war, and with no studio to shoot in, a new wave of Italian directors hit the streets instead. This inspired the neo-realist movement, where film makers such as Roberto Rossellini and Luchino Visconti shot documentary-style films depicting the harsh reality of post-war Italy. The success of these films helped sow the seeds for a new film industry; and when, in the 1950s, the studio was rebuilt, Fellini and a number of other directors were on hand to take advantage, ushering in what become known as the golden age of Italian cinema. It was during this time that Franco Mariotti would regularly cross Rome to visit the studio, for a chance to catch a glimpse of a film being shot - or even gain a small role. Today he is Cinecittà's cultural ambassador, but back then he was one of many people drawn by the allure of the studio. Cinema was a potent escape from the harsh post-war realities for the people of Italy, and while Fellini was filming the Oscar-winning La Strada in 1954, Mariotti got a bit part in Carmine Gallone's Casa Ricordi. In between his ceremonial duties at the recent Venice Film Festival, we caught up with Mariotti, who recalls Fellini's spiritoso (witty) side and an obsession with hair loss. "'Mariottino,' he would say (Fellini loved the diminutive), 'when did you lose your hair and how did it happen?'" Mariotti also waxes warmly about Fellini's impact. "He went around observing humanity, then painted pictures on the screen, inventions so vivid they became reality." Indeed, Fellini relished the on-set circus. In Damian Pettigrew's illuminating documentary Fellini: I'm a Born Liar (2002), Donald Sutherland describes the director on the set of Fellini's Casanova (1976) as "a martinet, dictator, Tartar, demon… tormenting everyone. The first five weeks of shooting were hell on earth. He was the medium and I was the mannequin." Behind-the-scenes footage shows Fellini's hands-on approach and brusqueness. He would shout instructions hysterically and manhandle the actors and extras. Fellini said, "Puppets are happy to be puppets, if the puppet has a good puppeteer." Today, Fellini's presence is everywhere on the Si Mostra tour. There's Venusia's colossal crowned head - seen emerging menacingly from the Venetian lagoon in Casanova - plonked by the pavillion Palazzina Presidenziale. Inside are more surreal props and sculptures, made by members of the De Angelis family, who have been working here for 70 years. Historic costumes in nearby Palazzina Fellini include Sutherland's dandy Casanova garb and Anita Ekberg's La Dolce Vita dress. Nino Rota's emotive soundtracks, which captured Fellini-esque magic and nostalgia, chime around every corner. Fellini's reconstructed office from Teatro 5 - the legendary 2,787m2 soundstage that was most favoured by the director - has his hat, scarf and coloured pens. For production director Maurizio Sperandini, the artisan ingenuity at Cinecittà lives on through today's impressive sets. "Life at Cinecittà is always frenetic," he says. "There are sometimes four sets being built simultaneously by a group of 50 full- timers plus temps. For the Rome TV set we had 200 workers, including carpenters, painters, scaffolders and painters." Building a 19th-century Broadway for Scorsese's Gangs of New York was "the most challenging", but one of Sperandini's career highlights came on the set of The Life Aquatic (2004), when the director, Wes Anderson, asked him to demolish the wall of Teatro 5 so his new lens, shipped from LA, could film the entire cross-section of a 50m-long ship. "I said it wasn't possible. Not even Fellini would have asked such a thing. There was panic. I proposed that we move the ship back five metres, but it seemed impossible without dismantling it - lights, fittings…" Then, using a special system of hydraulic pistons usually employed for raising bridges, Sperandini's crew shifted the ship 10cm at a time. "In less than 48 hours, we managed to move it five metres. Wes Anderson and the American producers were amazed." Of course, these days times are tough, even in the multimillion-dollar film industry. However, Cinecittà hopes tax breaks will woo more international film makers back - Woody Allen and Bertolucci have both just shot films here. In the meantime, the studio can cherish its position as the birthplace of Italian cinema and the place where Fellini plied his trade. "For me, every journey starts and ends at the studios of Cinecittà," the director said. "It's my ideal world. The cosmic space before the Big Bang."